MISS NATASHA ENQUIST: ELECTRO-ACCORDION CHANTEUSE: ACCORDION STYLE! 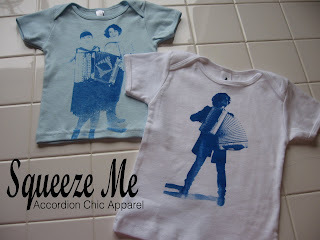 I launched my "Squeeze Me - Accordion Chic Apparel" back in June 2008, debuting my line of accordion wear to the Victoria Accordion Club's "Accordion's by the sea" festival. I am working on a website and online shop for my "Squeeze Me" line, but for now you can check out my business's fan page on Facebook: http://www.facebook.com/topic.php?topic=7829&post=40319&uid=53214100641#/pages/Squeeze-Me-Accordion-Chic-Apparel/48747192997?ref=s If you are on Facebook please support and join my "Squeeze Me" fan page, and feel free to add me as a friend! Accordion Noir Radio, on 102.7 FM Co-Op Radio, aside from having their own website at: http://www.accordionnoir.org, now has a Facebook group: http://www.facebook.com/group.php?gid=53214100641&ref=ts and I am proud to announce that I was appointed the group's official "Accordion Stylist." Thank you Rowan Lipkovits for giving me this admirable title, I am truly honoured.